Every year on June 24th, Florence celebrates its patron saint St. John the Baptist with a number of events throughout the city. The festivities start in the morning with a historical parade and end late in the evening with a spectacular fireworks show. In Roman times, it was the god Mars that protected the city of Florence. But after their conversion to Christianity, the Florentines choose St. John the Baptist (San Giovanni Battista) as their patron saint. One of the oldest buildings of Florence is the Baptistery, which is dedicated to St. John the Baptist. The south door of the building, sculpted by Andrea Pisano, tells the story of the life and death of the saint. The patron’s feast is an official holiday and although most shops and restaurants are closed it is one of the biggest events of the year. The museums are open to the public. 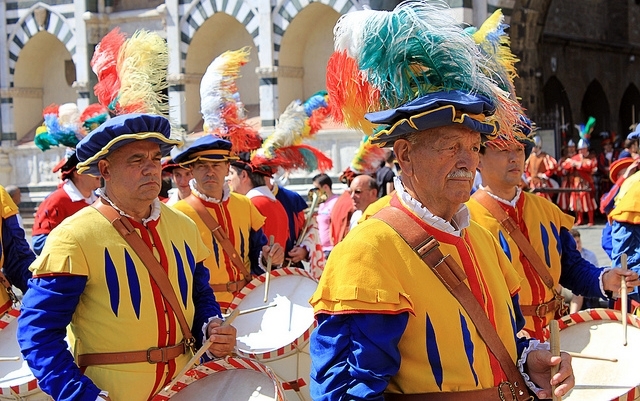 In the morning starting at 9am, a historical parade with over 100 characters dressed in Renaissance costumes sets off from Piazza della Signoria. Accompanied by the mayor of Florence, the parade moves towards the Baptistery where at 10am the traditional offering of candles for the patron saint takes place. 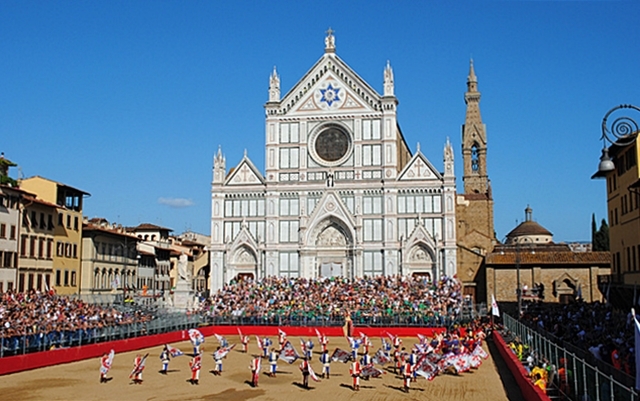 Before the soccer final, a historic parade sets off from Piazza Santa Maria Novella at 4pm. The procession with Renaissance characters, nobles on horseback, musicians and the famous flag throwing troupe the Bandierai degli Uffizi winds its way through the city center towards Piazza Santa Croce. Every June Piazza Santa Croce is transformed into an arena for the traditional Historical Florentine Soccer (Calcio Storico Fiorentino). The final match is always played on the evening of June 24th. 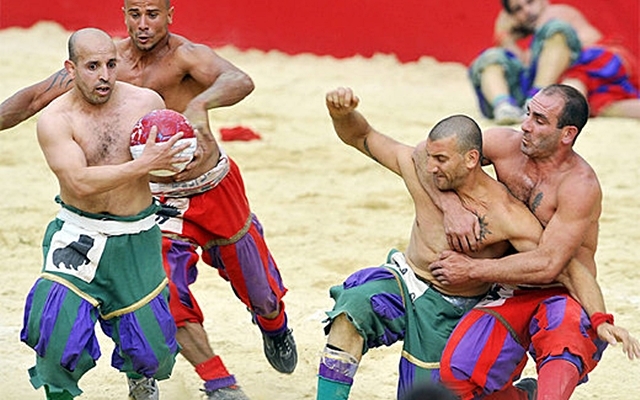 Calcio Storico is a violent mix of rugby, wrestling, and soccer, with origins that date back to the 16th century. Four teams of 27 players representing the historical quarters of Florence compete for the prestigious title. The match starts at 5:30pm. Since this is a very popular event it’s nearly impossible to obtain tickets. The Florence Rowing Club (Società Canottieri Firenze) organizes rowing races on the Arno River. The first race will be between the teams of the historic quarters of Florence. Followed by a rowing match between the team of the European University Institute and the team of the hosting Canottieri Firenze. The races start at 7pm at the rowing club on Lungarno Anna Maria Luisa dei Medici 8, close to Ponte Vecchio. The grand finale of the day is the spectacular fireworks show that in Florence are known as Fuochi di San Giovanni (St. John’s Fireworks). 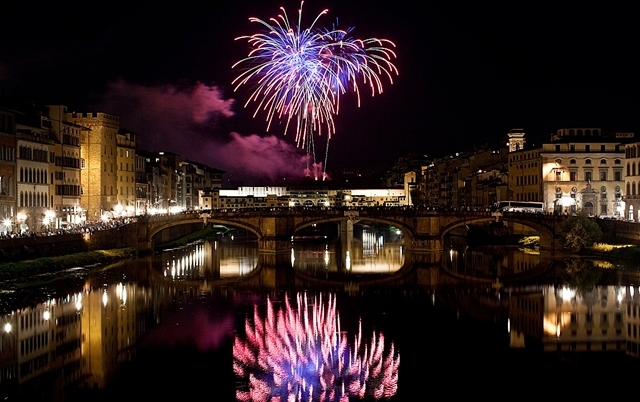 The fireworks are set off from Piazzale Michelangelo starting at 10pm. The best spots to enjoy the show can be found at the Arno river banks, Ponte Santa Trinità, Ponte alla Carraia, the urban beach Easy Living at Lungarno Benvenuto Cellini, 69R, or on the rooftops of local hotels. It’s recommended to arrive early because the show attracts a large crowd. Places to watch the spectacle from a greater distance are Fiesole and Settignano located high on the hills surrounding Florence. Fiesole can be easily reached by bus 7 from Piazza San Marco. Get off at Piazza Mino and climb via S. Francesco up to the panoramic point. Settignano can be reached by bus 10, get off at Settignano – Sosta Del Rossellino and walk to Piazza Desidero or Piazza Nuova.